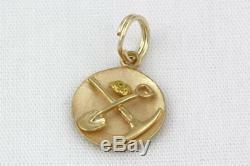 Collectible 14k Yellow Gold w/ Natural Nugget Miner's Charm. New: Straight from the factory. Excellent: Previously-owned estate piece, unused or lightly used. May be tarnished because of age. May also be described as "unused" or "like new". Very Good: Shows signs of gentle use. No wear, damage, or repair. May have minor hairline scratches/nicks consistent with light use. 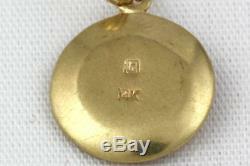 This 14k yellow gold charm has an applied shovel and pick axe with a natural nugget all on a miner's pan. This is a unique and collectible piece in very good condition with no signs of any removals, repairs, or alterations. Wide and weighs 1.5 grams. If you have questions or would like to speak with one of our representatives about this item please send us a message. All payments will be processed through'Northern Nevada Coin. All charges on your statement will show processed by Northern Nevada Coin. In the event of a listing error (such as a duplication) we reserve the right to cancel the order. We are only responsible for a GSP item until it is delivered to the U. The same condition and packaging as it was sent to you. We guarantee all items to be genuine. For about the last ten years we have also been supplying some of the highest quality jewelry and timepieces to customers all around the world. Our goal is to provide honest, trustworthy service and to become your online destination when you are looking for exceptional and unique pieces a cut above the rest. We began in Reno in August of 1993. After five years, Northern Nevada Coin moved its headquarters to Carson City, NV. In April of 2011 we opened our second location in Reno, NV followed by our third in Minden a year later. We recently moved our Minden store to Gardnerville! We also serve Sparks, North and South Lake Tahoe, Incline, Truckee, Fernley, Fallon, Minden, and other outlying areas, as well as attend several coin and jewelry shows throughout the year nation wide. We strive to bring you the best selection of vintage jewelry and novelties at competitive prices. As well as assorted flatware and hollowware at On a Silver Spoon. To see some of these items, please visit one of our sister stores linked below. Now with three great locations to serve you! Closed weekends & select holidays. Carson City Store: 601 North Carson Street Carson City, Nevada 89701. Plumb Ln Unit C Reno, Nevada 89502. We are proud to be one of over 7,000 members world wide of the International Watch & Jewelry Guild. It is known that anyone of any standing in the watch and jewelry industry is a member of the IWJG. The Gemological Institute of America is dedicated to ensure the public trust in gems and jewelry by upholding the highest standards of integrity, academics, science, and professionalism through education, research, laboratory services, and instrument development. GIA is considered to be the most widely used and trusted name in the diamond industry. The European Gemological Laboratory USA delivers exemplary evaluations with clear disclosure of diamond, gemstone, and jewelry features through cutting-edge gemological research, testing, and laboratory analysis. This ongoing work reflects the lab's core commitment to protecting both the industry and its consumers. We offer hundreds of different EGL certified stones; we are sure to have something that fits your needs. The Professional Numismatists Guild has virtually eliminated that feeling for thousands of collectors and investors throughout the U. PNG has a strict code of ethics and promotes the industry under the nomenclature of Knowledge. PNG dealers are often seen as the elite dealers of the industry, and we are proud to be among the few. The owner, Allen Rowe, is member #634 and is one of only three members in the entire state of Nevada (3/16/06). ICTA exists to promote and safeguard the interests of its members, serving as the industry watchdog to maintain an appropriate and favorable regulatory climate in the U. ICTA also offers its members assistance and information on new and existing laws and regulations pertaining to the industry. The item "Collectible 14k Yellow Gold with Natural Nugget Miner's Charm" is in sale since Friday, March 2, 2018. 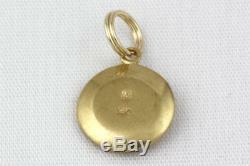 This item is in the category "Jewelry & Watches\Fine Jewelry\Fine Charms & Charm Bracelets". The seller is "seekingjewelry" and is located in Gardnerville, Nevada. This item can be shipped to United States, Canada, United Kingdom, Denmark, Romania, Slovakia, Bulgaria, Czech republic, Finland, Hungary, Latvia, Lithuania, Malta, Estonia, Australia, Greece, Portugal, Cyprus, Slovenia, Japan, Sweden, South Korea, Indonesia, Taiwan, Thailand, Belgium, France, Hong Kong, Ireland, Netherlands, Poland, Spain, Italy, Germany, Austria, Israel, Mexico, New Zealand, Philippines, Singapore, Switzerland, Norway, Saudi arabia, United arab emirates, Qatar, Kuwait, Bahrain, Croatia, Malaysia, Chile, Colombia, Costa rica.